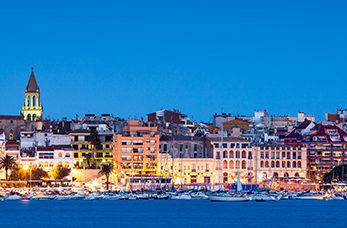 Palamos is located in the heart of the Costa Brava, it was once a small fishing village and still retains its heritage as the catch of the day is auctioned off on the quayside. Visit one of the many beautiful beaches for a dip in the crystal clear water or explore the coastal path's along the cliff tops to for some spectacular views. Visitors to this museum will discover the world of fishing in the Mediterranean, and the chance to find out all about the skills that are needed to develop the art of fishing. Head to this sandy beach just north of Palamos, concealed by pine forests, swim in the crystal clear water or explore the ancient Iberian settlement at the eastern end of the beach. One of the most famous and breathtaking locations to visit in Barcelona the most famous building in the entire city and its landmark, La Sagrada Familia. Although incomplete, the church is a UNESCO World Heritage Site. This former theatre is home to the famous Dali Museum, here you can view the remarkable collection of works including a vintage Cadillac, paintings, sculptures, drawings and sketches by the artist Dali.